Obamacare Is Now Health Care Law! What Does This Mean For MRI? Nothing. Or, at least, not a whole lot. It is still the PATIENT’S job to make sure they get the highest quality MRI. Obamacare (or the Affordable Care Act “ACA”) expands medicaid and some low cost insurance. That’s great, but doctors will likely continue to send their patients to the same 20-year old scanners they have been using for years. It is sad that most doctors and patients seem to think MRI technology has not advanced in the past 20 years. It has advanced a lot. If you look at magnet strength alone, they now range from 0.3T (think old TV with rabbit ear antenna—snowy pictures) all the way up to 1.5T (cable tv … good solid image; nothing fancy) or 3.0T (Hi-Def/BluRay). If you wanted to look at an image to make a decision about surgery, what sort of image quality would YOU want? 3T technology is the undisputed king of MRI. The finest, most detailed images available today. It sees up to 240% more lesions in MS patients. People really need to know this. There are not very many 3T scanners in Delaware. Do you want to have your MRI done at the closest facility or at the best? 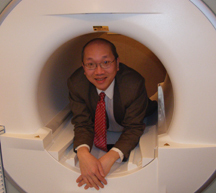 MRI Consultants has been offering 3T MRI to Delaware since 2007—and we have an out-of-pocket price of only $500! The 32-channel, 3T MRI scanner that we have installed in our new office in Lewes, is second to none for brain imaging. You’ve heard a lot in the press about veterans returning from Afghanistan with Traumatic Brain Injury. This can also occur in car accidents or football injuries. Our scanner in Lewes is able to detect this using a process called Diffusion Tensor Imaging (“DTI”). This process actually shows microscopic damage to the fibers of the brain! It can do quantitative analysis of the white and gray matter and of the CSF. And, it can show hippocampal atrophy, which is related to alzheimer’s disease. The other MRI and/or CT scanners in the state simply do not have this capability. BLADE is advanced software which freezes motion. Most scanners do not have BLADE. Our 1.5T OPEN MRI does. The ability to compensate for a patient’s movement greatly improves female pelvis, abdomen, brain and spine imaging. It is also very useful for shoulder and knee imaging. Anything which gives you a clearer picture helps everyone. We do this standard on our OPEN MRI pelvis studies. Sally Ride (the first female astronaut) died of pancreatic cancer. Did you know that both our 3T MRI and our 1.5T OPEN MRI can find early abdominal and pelvic cancer using a special sequence/software called REVEAL. We add it on to your study for free. You can’t get REVEAL done elsewhere for free. Our OPEN MRI also has a sequence called NATIVE, which allows us to see your blood vessels without a dye injection. And, it has the full range of CARDIAC MRI sequences. Another thing to be considered when selecting an MRI facility is the experience of the people using the technology—how much experience do the people have using 3T MRI technology. Who is the radiologist? Where did the radiologist train? How much experience in MR does the radiologist have? Only this morning, a possible MS patient asked me if a small disc herniation was causing his parathesias (tingling and numbness). The answer was no. Find out if you will be able to discuss your results with the radiologist at the time your study is performed. At MRI Consultants we have been doing this for years. At most places, patients never actually see the radiologist—much less get a chance to discuss results. Generally, a report is faxed to their referring physician, who informs the patients as to the results. At MRI Consultants, we are interested in the latest developments in MRI technology—not just how many back and knee scans we can push through on any given day! We want to provide services the other facilities can’t. Things like metal substraction imaging. Indirect arthrography. Super high resolution studies—only which can be done at 3T. Quantitative brain volume measurements. Susceptibility weighted imaging for hemorrhage. Diffusion tensor imaging. Proton spectroscopy. Prostate MRI. 3T Breast MRI—which is 100% sensitive for breast cancer. And we work hard to make sure our services are affordable to people without insurance as well as those with very high deductibles! Our abdomen study for 500 dollars is able to pick up smaller pancreatic cancers, smaller liver cancers and includes diffusion weighted imaging for free. This new technique is 96% sensitive. Ask questions. It could save you hundreds of dollars. The quality of an MRI is based on the strength of the MRI scanner and the experience of the radiologist—NOT where that scanner is located. Your doctor writes the prescription for an MRI; you get to choose where to fill it. Always check with your insurance. Occasionally having your study done at a hospital based MRI might cost several hundred extra dollars than having your study at a outpatient doctors office. Our facilities generally cost less than the hospital.